This book provides a valuable reference tool for technical and management personnel who lead or are a part of incident investigation teams. This second edition focuses on investigating process–related incidents with real or potential catastrophic consequences. It presents on–the–job information, techniques, and examples that support successful investigations. 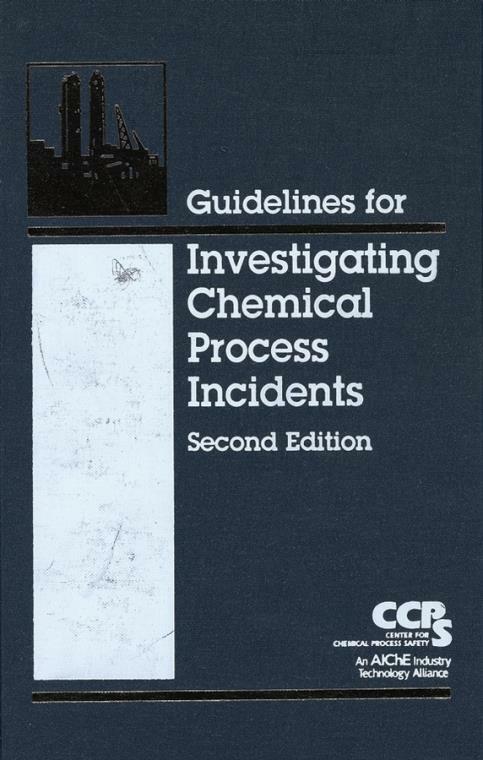 The methodologies, tools, and techniques described in this book can also be applied when investigating other types of events such as reliability, quality, occupational health, and safety incidents. The accompanying CD–ROM contains the text of the book for portability as well as additional supporting tools for on–site reference and trouble shooting. 1.1 Building on the Past. 1.2 Who Should Read This Book? 1.3 The Guideline s Objectives. 1.4 The Continuing Evolution of Incident Investigation. 2. Designing an Incident Investigation Management System. 2.1.1 An Organization s Responsibilities. 2.1.2 The Benefit of Management s Commitment. 2.1.3 The Role of the Developers. 2.1.4 Integration with Other Functions and Teams. 2.1.5 Regulatory and Legal Issues. 2.2 Typical Management System Topics. 2.2.2 Other Options for Establishing Classification Criteria. 2.2.4 Describing Team Organization and Functions. 2.2.8 Fostering a Blame–Free Policy. 2.2.9 Implementing the Recommendations and Follow–Up Activities. 2.2.10 Resuming Normal Operation and Establishing Restart Criteria. 2.2.11 Providing a Template for Formal Reports. 2.2.13 Planning for Continuous Improvement. 2.3 Implementing the Management System. 2.3.2 Initial Implementation Data Management System. 3. An Overview of Incident Causation Theories. 3.1 Stages of a Process–Related Incident. 3.1.1 Three Phases of Process–Related Incidents. 3.1.2 The Importance of Latent Failures. 3.2 Theories of Incident Causation. 3.2.1 Domino Theory of Causation. 3.3 Investigation s Place in Controlling Risk. 3.4 Relationship between Near Misses and Incidents. 4. An Overview of Investigation Methodologies. 4.3 Methodologies Used by CCPS Members. 4.5 Selecting an Appropriate Methodology. 5. Reporting and Investigating Near Misses. 5.1 Defining a Near Miss. 5.2 Obstacle to Near Miss Reporting and Recommended Solutions. 5.2.1 Fear of Disciplinary Action. 5.2.3 Lack of Understanding: Near Miss versus Nonincident. 5.2.4 Lack of Management Commitment and Folow–through. 5.2.5 High Level of Effort to Report and Investigate. 5.2.6 Disincentives for Reporting Near Misses. 5.2.7 Not Knowing Which Investigation System to Use. 6. The Impact of Human Factors. 6.3 Incorporating Human Factors into the Incident Investigation Process. 6.4 How an Incident Evolves. 6.4.3 Preconditions for Unsafe Acts. 7. Building and Leading an Incident Investigation Team. 7.2 Advantage of the Team Approach. 7.3 Leading a Process Safety Incident Investigation Team. 7.5 Training Potential Team Members and Support Personnel. 7.6 Building a Team for a Specific Incident. 7.7 Developing a Specific Investigation Plan. 7.9 Setting Criteria for Resuming Normal Operations. 8. Gathering and Analyzing Evidence. 8.1.1 Developing a Specific Plan. 8.1.2 Investigation Environment Following a Major Occurrence. 8.1.3 Priorities for Managing an Incident Investigation Team. 8.2.3 Physical Evidence and Data. 8.2.4 Paper Evidence and Data. 8.2.5 Electronic Evidence and Data. 8.2.6 Position Evidence and Data. 8.4.1 Basic Steps in Failure Analysis. 8.4.2 Aids for Studying Evidence. 8.4.3 New Challenges in Interpreting Evidence. 8.4.5 The Use of Test Plans. 9. Determining Root Causes Structured Approaches. 9.1 The Management System s Role. 9.2 Structured Root Cause Determination. 9.3 Organizing Data with a Timeline. 9.3.2 Determining Conditions at the Time of Failure. 9.4 Organizing Data with Sequence Diagrams. 9.5 Root Cause Determination Using Logic Trees Methods A. 9.5.1 Gather Evidence and List Facts. 9.6.1 Choosing the Top Event. 9.6.3 Example Chemical Spray Injury. 9.6.4 What to Do If the Process Stalls. 9.6.5 Guidelines for Stopping Tree Development. 9.7.1 Application of Fact/Hypothesis Matrix. 9.8 Case Histories and Example Applications. 9.8.1 Fire and Explosion Incident Fault Tree. 8.1.2 Data Driven Cause Analysis. 9.9 Root Cause Determination Using Predefined Trees Method B. 10.2.2 Attributes of Good Recommendations. 10.3.2 Hierarchies and Layers of Recommendations. 10.3.5 The Incompletely Worded Recommendation. 10.4.2 Develop and Examine Preventive Actions. 10.4.3 Perform a Completeness Test. 10.4.4 Establish Criteria to Resume Operations. 10.4.5 Prepare to Present Recommendations. 10.4.6 Review Recommendations with Management. 11. Communication Issues and Preparing the Final Report. 11.2 Writing the Formal Report. 11.3.4 Sequence of Events and Description of the Incident. 11.3.5 Evidence and Cause Analysis. 11.5 Tools for Assessing Report Quality. 12. Legal Issues and Considerations. 12.1 Seeking Legal Guidance in Preparing Documentation. 12.1.1 Use and Limits of Attorney Client Privilege. 12.2 The Importance of Document Management. 12.4 The Challenges and Rewards of Sharing New Knowledge. 12.5 Employee Interview and Personal Liability Concerns. 12.6 Gathering and Preserving Evidence. 12.7 Inspection and Investigation by Regulatory and Other Agencies. 12.8 Legal Issues Related to Postinvestigation . 13. Implementing the Team s Recommendation. 13.2 What Happens When There Is Inadequate Follow–up? 13.2.4 Challenger Space Shuttle Incident. 13.3 Management System Considerations for Follow–up. 13.3.3 Assigning a Responsible Individual. 13.3.4 Determining Action Item Priority. 13.3.5 Implementing the Action Items. 13.3.6 Documenting Recommendation Decisions the Audit Trail. 13.3.8 Revising the Incident Investigation Management System. 13.4.1 Performing the Follow–Up Audit. 14. Continuous Improvement for the Incident Investigation System. 15.1 Learning Lessons from Within Your Organization. 15.2 Learning Lessons from Others. 15.6.1 Esso Longford Gas Plant Explosion. 15.6.2 Union Carbide Bhopal Toxic Gas Release. 15.6.3 NASA Challenger Space Shuttle Disaster. 15.6.4 Tosco Avon Oil Refinery Fire. 15.6.5 Shell Deer Park Olefins Plant Explosion. 15.6.6 Texas Utilities Concrete Stack Collapse. 15.6.7 Three Mile Island Nuclear Accident. Appendix B. Professional Assistance Directory. Appendix C. Photography Guidelines for Maximum Results. Appendix D. Example Case Study Fictitious NDF Company Incident. Appendix E. Example Case Study More Bang for the Buck: Getting the Most from Accident Investigations. Appendix F. Selected OSHA and EPA Incident Investigation Regulations. Appendix G. Quick Checklist for Investigators. Appendix I. Contents of CD–ROM.